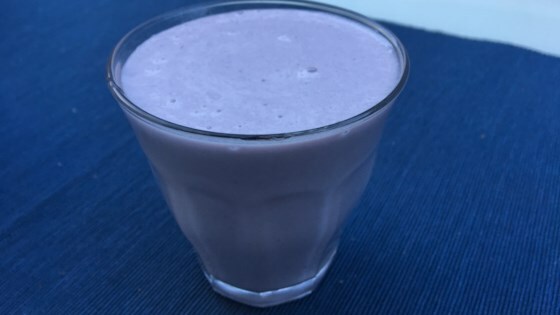 "Make yourself a tasty purple milkshake with the addition of ube, aka purple yam. The cooked ube brings nice flavor to the shake!" Place a steamer insert into a saucepan and fill with water to just below the bottom of the steamer. Bring water to a boil. Add ube, cover, and steam until tender, about 20 minutes. Cool until easily handled and cube. Measure 1/4 cup of the cooked ube. Combine 1/4 cup ube, milk, and vanilla ice cream in a blender; blend until smooth. If you can't find fresh-cooked ube, you could use ube jam or powdered ube instead. Nutrition data for this recipe includes the full amount of ube. The actual amount of ube consumed will vary. This is a yummy way to use ube! The shake reminds me of an ube smoothie I tried at my local boba shop. My toddler son also loved it. Thanks for the recipe!